In a previous article New Build Features in TFS 2015 and Visual Studio Online we discussed various new features of Team Foundation Server 2015 Build. 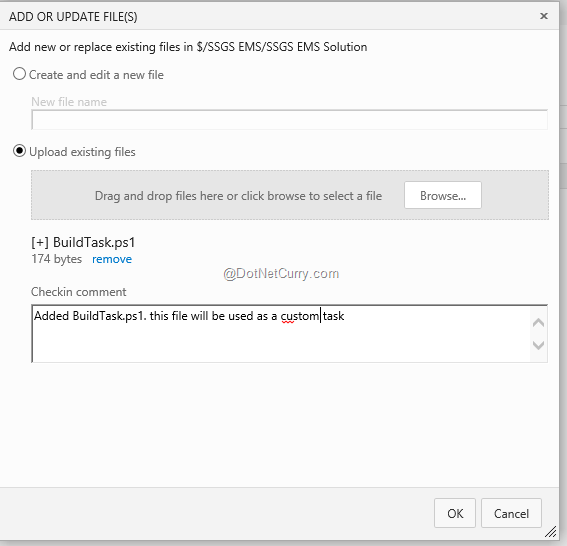 In this article, we will discuss how to customize Build activities. First we will add existing step to the build definition, and later create a PowerShell script and add it to build definition. Visual Studio 2010 along with Team Foundation Server 2010 introduced a major change in build workflow by making it XAML based. Let us compare this old architecture with the new one with Team Foundation Server 2015. 1. The build system is task based. Team Foundation Server sends tasks to agent. A list of these tasks is available at open source link. 2. The agent is chosen from pool based on capabilities. These capabilities can be from Operating System, .NET framework to the processor for agent. This comes in the form of name value pairs. There can be multiple agents. 3. The agent in turn assigns environment variables with build information. The list of environment variables is at this link. 5. The agent sends logs back to TFS to show real time log. These logs are shown real time. 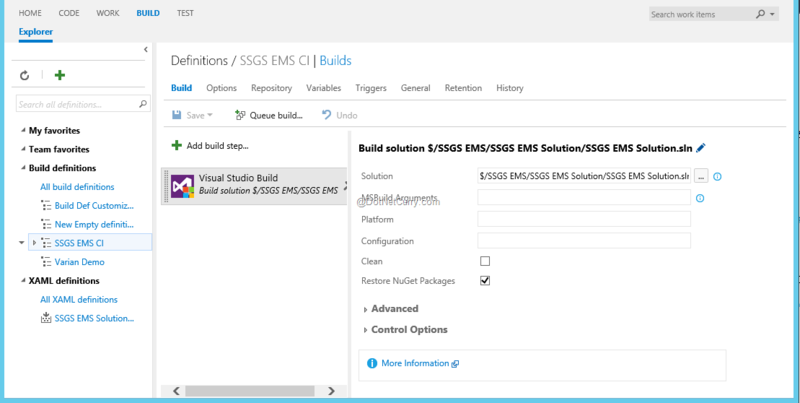 Team Foundation Server 2015 provides support to non-windows builds. There is no need to create complete build definition as templates are available. The customization is easy as we only have to add custom tasks. 2. 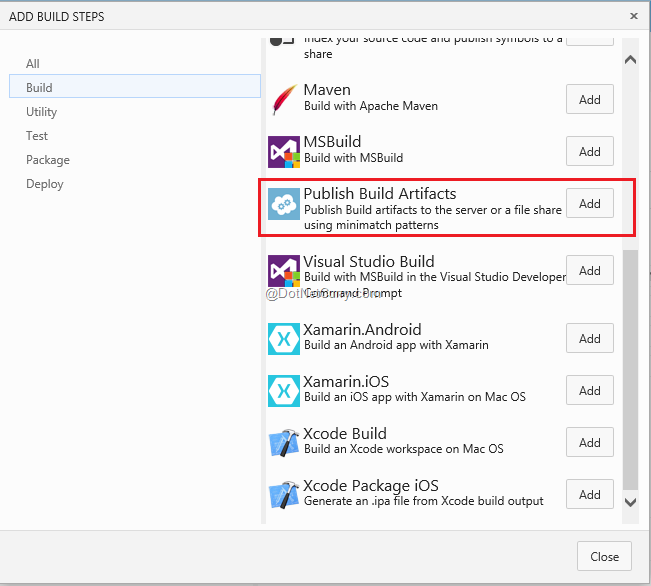 Click on Add build step, select step from Build tab named “Publish Build Artifacts” and click on Add. Close the window for adding steps. 3. We have to configure the newly added step. We need to specify values for following arguments. Copy Root: this specifies the root folder which contains the files you want to copy. If you keep it empty, it will copy from repository. Contents: the files which you want to copy to the location. Entering **\bin will copy files in any folder named bin. I have created a shared folder named BuildDrops where I want the binaries to be dropped. 4. Save the build and Queue it. After successful completion of the build, we can select the Artifacts tab and find our artifact in it. 5. Explore the DropLoc and find the binaries dropped at the specified location. Now that we have seen how to add an existing step to the build definition, let us create a new task by creating a PowerShell script and add it as a step to the build definition. I am going to create a simple PowerShell script file and add it to the source control. Later I will add a new step to build definition and point the location where the .ps1 file exists. 6. Create a PowerShell Script fie with some statements. I have created a basic file which displays some arguments passed and also displays environment variable. 7. Now we need to check in this .ps1 file into the source control. 8. Let us add this script as a new task. Select Add Build step and select PowerShell script as type. 9. We need to specify script file name by browsing to the source control path and also the parameter which goes as argument needs to be given. In this article we discussed how easy it is to add a custom task for Team Foundation Server 2015 Build. A new task can be a PowerShell script file, a json file with plugin or it can even be an icon we need to embed. We discussed how to use a PowerShell script in this article.